"Good enough to be called a nailer"
Our Northport Nailer spoons are the best value on the market today, made with a paint finish that does not disappear. The 100SK & 300HS-K are made with spring brass to hold their shape, and then silver-plated and painted. The Lunker Lifter is an aid to safely de-hook fish. It also works great to hold and display fish for pictures. 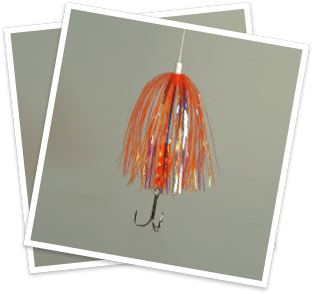 The Lunker Lifter works well on small and large fish as well as saltwater fish. It’s made from a tough plastic material so it will not break. Magna Dyne Products thanks you for visiting our web site and considering our products. Since the birth of Salmon fishing on the Great Lakes, “Northport Nailers®” has been catching fish and winning tournaments on a regular basis. No matter what you are fishing for, if trolling is your method, then we have a lure for you. 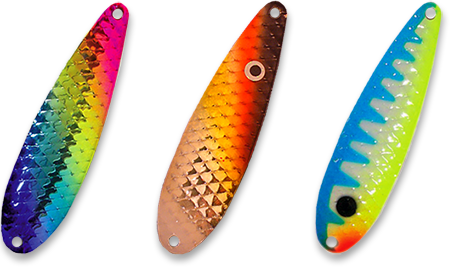 The lures that we sell are one of a kind and unique, so you know that you will be getting a high quality product. You can count on us to get you the best quality fishing lures available. Whether you have been referred to us by another satisfied customer or have stumbled upon us on your own, you have made the right choice by visiting Magna Dyne Products. This is where you should go to get the best! All your fishing tackle needs can be met right through our site here. 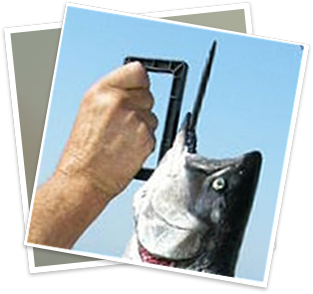 Northport Nailers are of the finest quality fishing lures available. People have been catching massive quantities of quality fish over the years using these Northport Nailers. If you need quality fishing supplies then look no further than us. Please look around the site for what you need, or call us today for any questions you have, or additional information you may require. Magna Dyne Products represent some of the finest, high quality, durable fishing products available anywhere. For more than forty years “Northport Nailer® ” has been catching fish all over the world. Based in Michigan, all of our Spoons and our Nailer Flies are made in the USA, giving us an opportunity to try and prove our lures before production starts. Changes in color, design, size and materials for lures is ongoing through field testing and good fishing science. Many Captains are helping us with designs and color selections to better prepare our customers for productive days on the water.